Join us for the 5th Annual Maine Catholic Women's Conference on Saturday, April 9, from 8:30 a.m. to 4 p.m. Doors open at 8:30 a.m., and the conference will begin with Mass celebrated by Bishop Robert P. Deeley, at 9 a.m. A continental breakfast will follow Mass. The day will feature a variety of programs, testimonies, workshops, music, and much more! This year's theme is "Feed my Lambs" (John 21:16). Stay tuned for details on a special "Ladies Night Out" on Friday, April 8! Father Leo Patalinghug will serve as the keynote speaker. Fr. Patalinghug is the creator of “Grace Before Meals,” an international apostolate which helps strengthen families and relationships through God’s gift of a family meal. He is the host of “Savoring our Faith” on EWTN and co-host of “Entertaining Truth” on Sirius XM Radio. 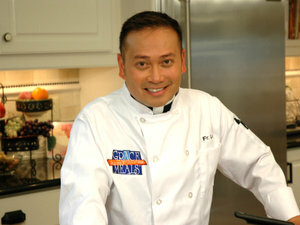 His work has also been featured on ABC, CBS, NBC, PBS, and even The Food Network, where he appeared on "Throw Down! with Bobby Flay." Father Patalinghug is a member of a community of consecrated life, Voluntas Dei (Latin for "The Will of God"). This community is a Secular Institute of Pontifical Rite. In addition to "Grace Before Meals," he is establishing a non-profit organization called "The Table Foundation" with the mission of elevating culture and family life, one meal at a time. His message combines faithful Catholic theology presented in a way that is easy to understand and appreciate. Using his unique background as a chef, a third-degree black belt martial arts teacher, and a former award-winning choreographer for a dancing group, Father Patalinghug's presentations, retreats, parish missions, and keynote talks have brought diverse audiences closer to the Lord's Table. A small block of rooms has been reserved at the Hilton Garden Inn Auburn Riverwatch for Friday, April 8. To access the special deal, click here. Please call (207) 321-7898 for more information. We need you to spread the word about this uplifting and encouraging day for the women of Maine. Regretfully, babysitting is not available.